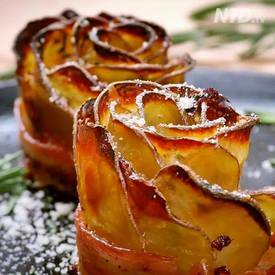 Bacon-potato roses are fairly easy to assemble, too. A muffin tin makes things easier. But a round or oval gratin baking dish would also work. One of the best parts of these little beauties: They’re customizable. Use your favorite fresh or dried herbs – maybe even a sprinkling of cheese – to dress them up to your liking. Spice things up with a pinch of cayenne and a little nutmeg.